Crossovers is a massive timeline of crossover stories in which characters, situations, or universes are linked together in order to build the Crossover Universe. 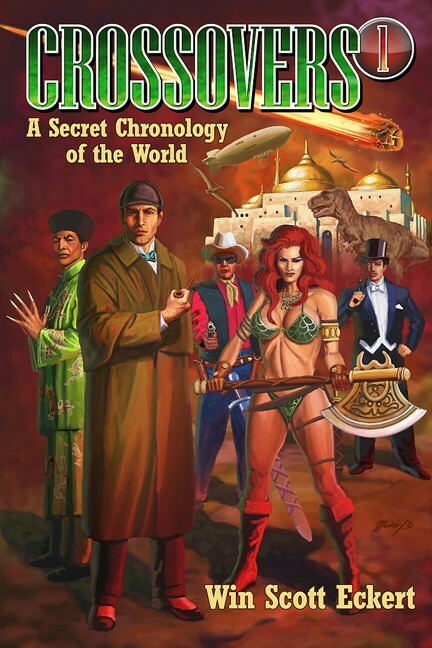 Lovingly compiled by crossover and Wold Newton expert Win Scott Eckert, Crossovers lists upwards of 2000 crossover stories, with innumerable additional timeline entries which outline the secret history of the land of fiction. With introductions by Kim Newman (Volume 1) and Jess Nevins (Volume 2), each volume is illustrated with over 200 book and magazine covers, and contains appendices covering myriad television crossovers, alternate universes, and Newman's Anno Dracula series. Win Scott Eckert is the editor of and a contributor to Myths for the Modern Age: Philip Jose Farmer's Wold Newton Universe, a 2007 Locus Awards finalist. He has written numerous short stories for Black Coat Press' Tales of the Shadowmen series, as well as tales for Moonstone Books about The Avenger, The Phantom, Zorro, Captain Midnight, and The Green Hornet. He contributed the Foreword to Philip José Farmer's seminal "fictional biography," Tarzan Alive (Bison Books, 2006), and co-authored with Farmer the Wold Newton novel The Evil In Pemberley House, about Patricia Wildman, the daughter of a certain bronze-skinned pulp hero.